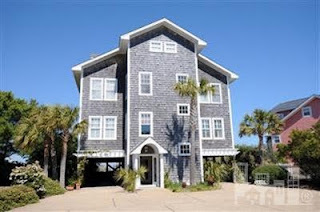 101 Circle Drive in Wrightsville Beach is an amazing property in a gorgeous location. The 10 bedroom, 7 bath custom built home sits on a half acre lot - one of the largest private lots in all of Wrightsville Beach. It has room for 15 parking spaces (4 covered spaces), a side yard and garden, established old growth native trees and vegetation, and provides privacy in a no-traffic community. The property at 101 Circle Drive is located in Shell Island Village near the north end of Wrightsville Beach. It is a soundfront property with a private sandy beach that experiences very little current - perfect for boat storage and water recreation. The estate includes a 30' boat slip with a lift, a dock, and a sun shaded deck. Its location also provides easy access to N. Lumina Ave and ocean beach access points #8 and #9. We invite you to take a Virtual Tour of the property to truly appreciate all it has to offer. Please call the agents at Hardee Hunt and Williams Wrightsville Beach Real Estate to schedule a personal guided tour: 800-852-1605.